Every year, we vacation with my husband's family in the Outer Banks. We usually stay for a week and have rent the same house each year, since 2009. As fun as the beach and pool are, we also like to do other things while we're in the Outer Banks. 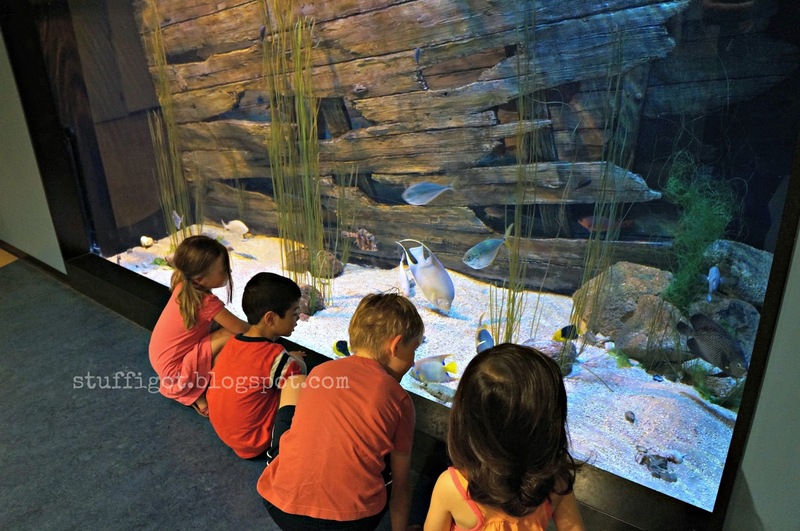 One place we almost never miss visiting is the North Carolina Aquarium on Roanoke Island. The North Carolina Aquarium on Roanoke Island is about a 45 minute drive from where we stay in the Outer Banks (Duck, NC). It opens at 9 AM and we usually try to get there right around then. 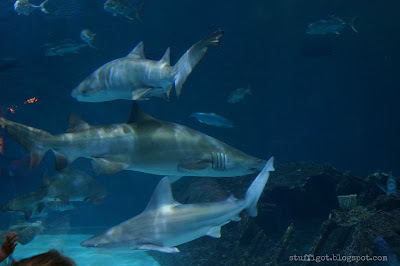 The aquarium isn't huge and can start getting crowded by lunch time. The aquarium has indoor and outdoor exhibits. We like to start with the inside exhibits. The lobby has a tank that the kids love to look at. My 4 year old son loves watching the fish swim around! Try not to speed through the lobby and don't forget to look up! 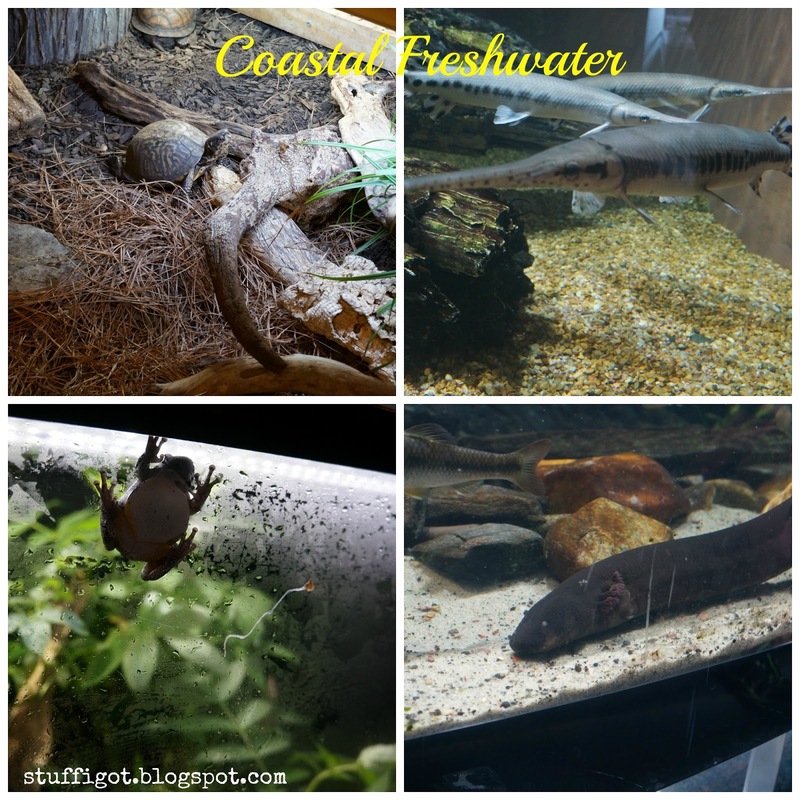 To the right of the lobby is the Coastal Freshwater exhibit. Here you'll find snakes, small frogs and turtles and many freshwater fish! Plus, this guy -- he's my favorite! 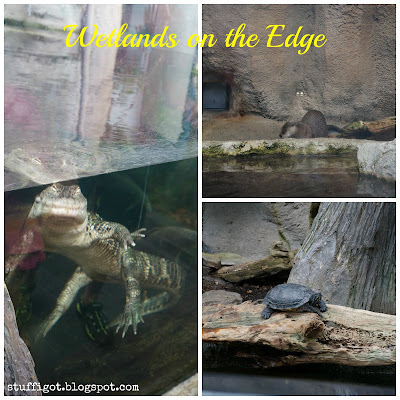 Next is the Wetlands on the Edge exhibit, which features otters, alligators and turtles. In the next room, you can take photos in front of a green screen and they can add special effects to the picture, like a shark or turtles. We've done these in the past and they make a fun souvenir. 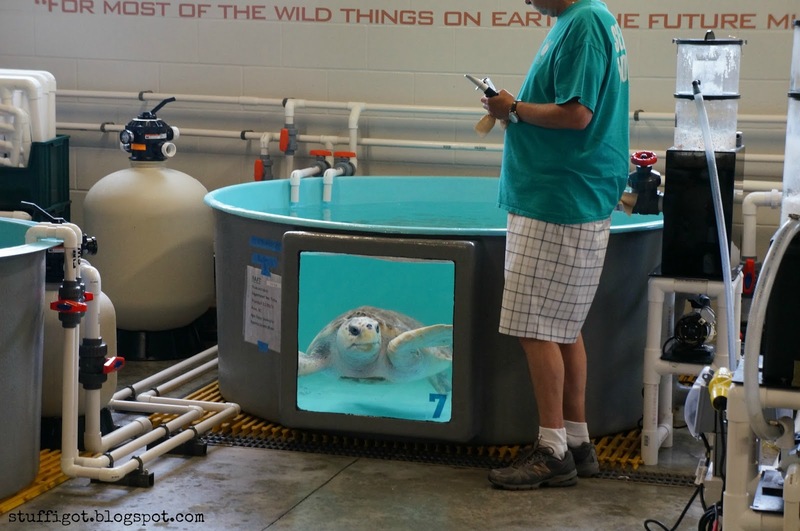 New to us this year was the STAR (Sea Turtle Assistance & Rehabilitation) Center, which opened in 2014. In one room, they had several tanks filled with turtles that they had been treating and rehabilitating, like this loggerhead turtle. 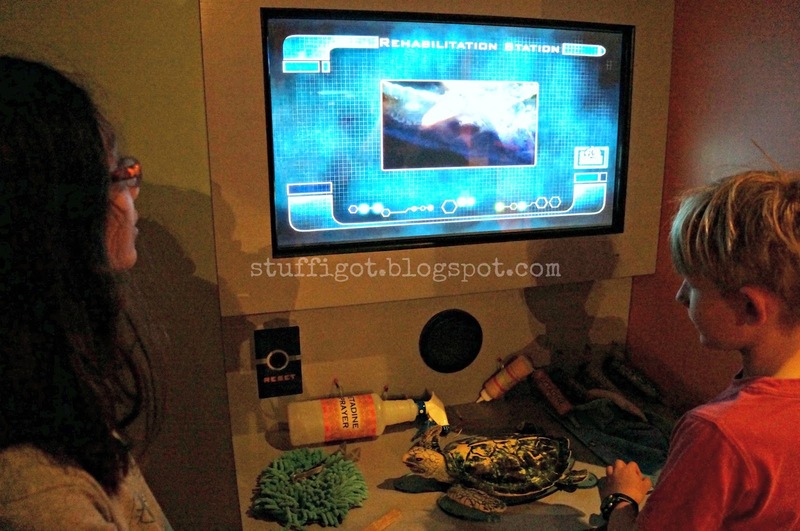 In the next room, you get to act like you're rehabilitating turtles. 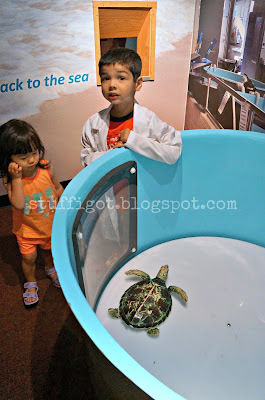 You can don a white lab coat and take your turtle to be analyzed and treated and sent back into the ocean. The kids had a lot of fun and we spent a good chunk of time here. 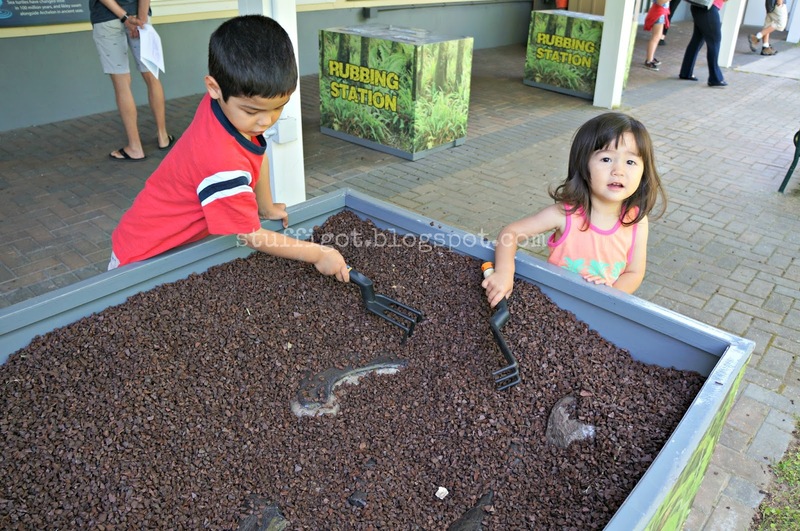 There are also exhibits on Marine Communities, which feature eels, seahorses and lobsters, and Close Encounters, where you can touch sting rays, sea stars and other sea animals. 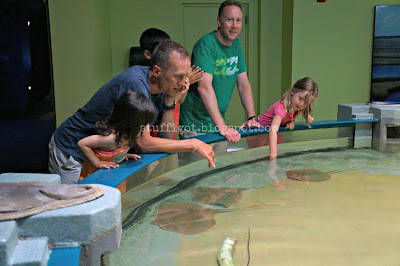 The kids always try to touch the rays! 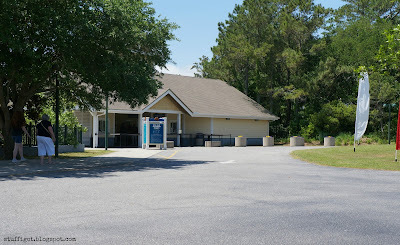 The aquarium also features a 285,000 gallon Graveyard of the Atlantic exhibit, which houses the largest collection of sharks in North Carolina. 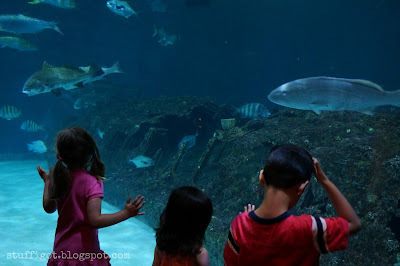 The kids stood here for awhile just watching all the sharks swim around. 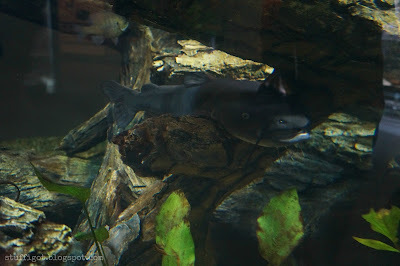 After you leave the shark exhibit, you have the gift shop and you can also look at and purchase the special effects pictures if you had them taken in the aquarium. You can then exit to go to the outside exhibits. Just outside the aquarium is an area dedicated to the Tyrannosaurus Trek exhibit. 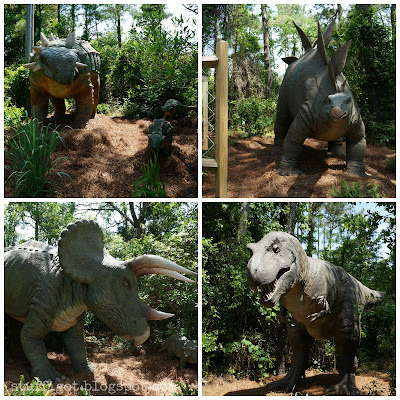 You can make chalk rubbings of different dinosaurs, dig for fossils and take pictures with a Triceratops and a T-Rex head! 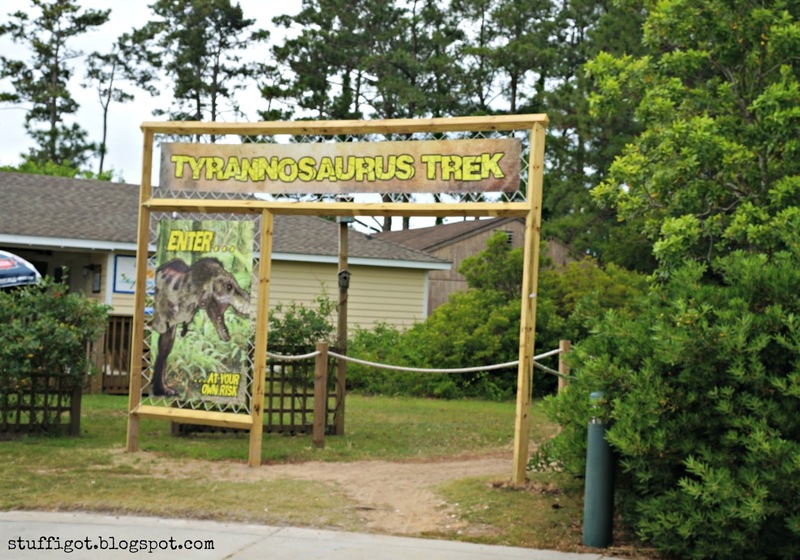 The Tyrannosaurus Trek is a walk-through exhibit featuring realistic, animatronic dinosaurs, including Triceratops, Ankylosaurus and Tyrannosaurus Rex. 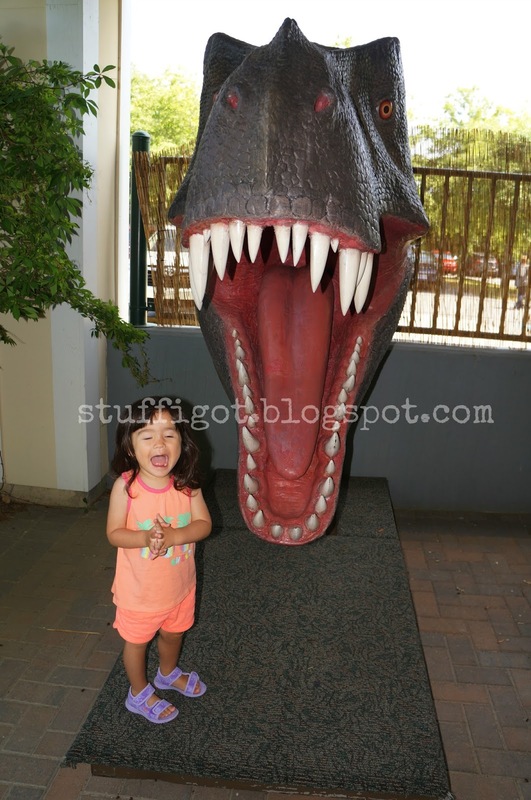 A heads up, the dinosaurs move and roar, so younger kids might get scared. After checking out the dinosaurs, we headed back to our beach house. 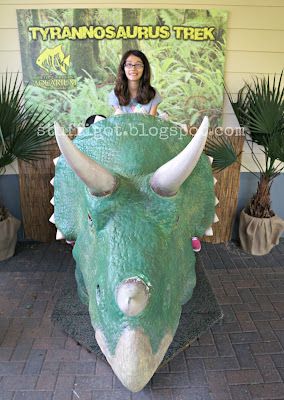 We had a great time and will definitely visit again next year! 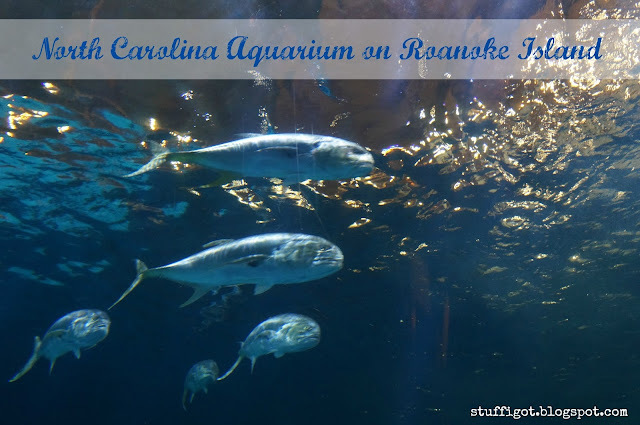 Interested in visiting The North Carolina Aquarium on Roanoke Island? The aquarium is open daily, year-round, from 9 AM - 5 PM. Admission fee is $10.95. Seniors and military are $9.95. Children aged 3-12 are $8.95. 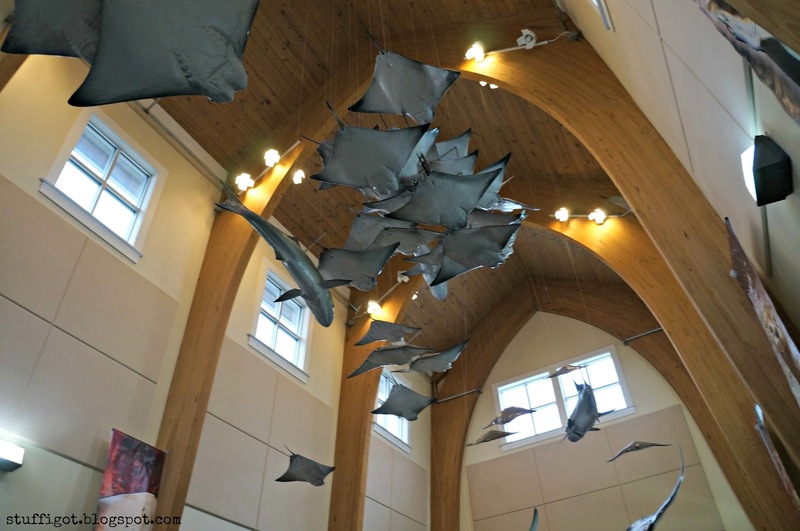 Planning to visit the Outer Banks sometime soon? Check out my post about other activities we like to do while in the Outer Banks!